I've had my eye on the challenge at Global Design Project all week. 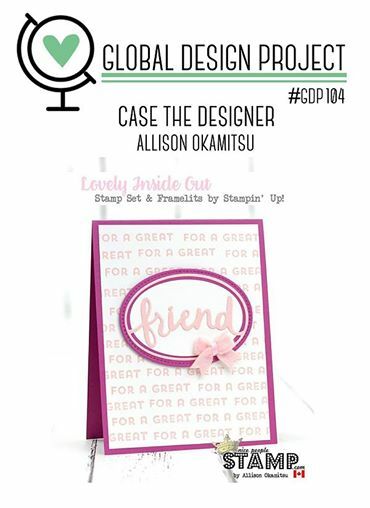 The challenge is to CASE a card by team member and Artisan, Allison Okamitsu. One thing that I wanted to take from this project was the repeat stamped background. 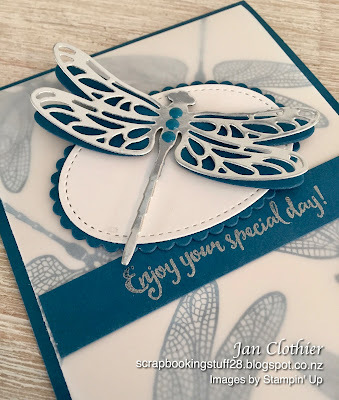 The others were to do with the layout, specifically the coloured card base and the oval medallion nearer the top than the bottom. I also really liked that the centre of Allison's card was a quiet oasis against the busyness of the background. To soften the background, I not only stamped off the Dapper Denim once, I also layered a piece of vellum over it before adding in the centre medallion. 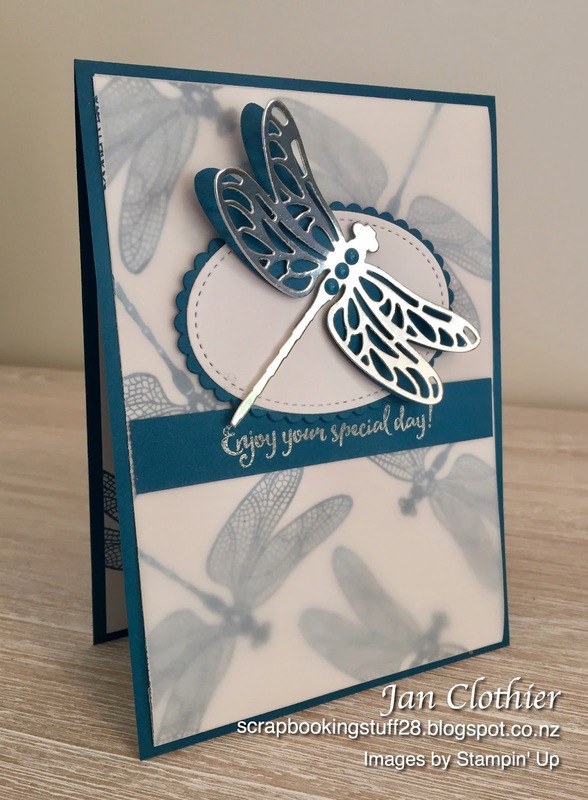 That is also why I did not add any extra embellishment to the area around the dragonfly. I did add in a solid sentiment strip underneath. I like how it's like ruling a line underneath and on a more practical level, it meant the glorious wings weren't obscuring it either! 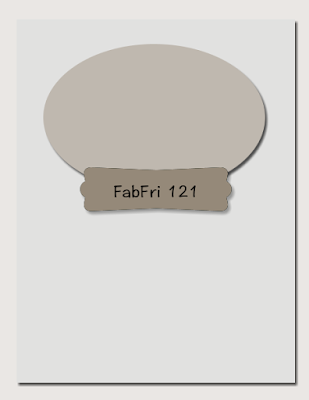 Once I did that, it also started looking a lot like the sketch at Fab Friday, which I'd also had my eye on. Although I had a different idea for that, I'm going to play there too with this card. 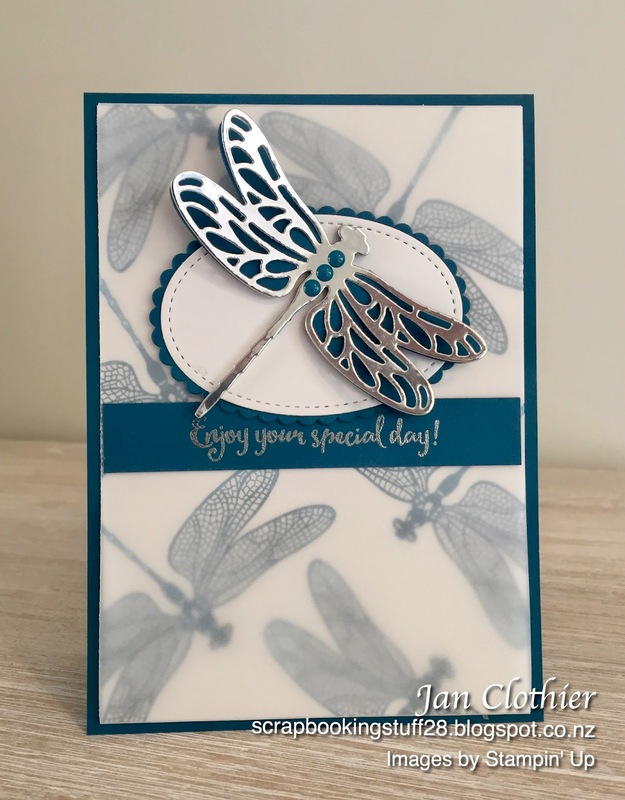 Other: silver embossing powder, Detailed Dragonfly thinlits, Stitched Shape framelits, Layering Oval framelits, dimensionals, 2016-18 In-Colour enamel shapes (retired). Wow, I LOVE the detail you have included here! The softened background, the vellum layer, the silver dragonfly with bits of blue sparkle - just lovely! Thanks so much for playing at Fab Friday!